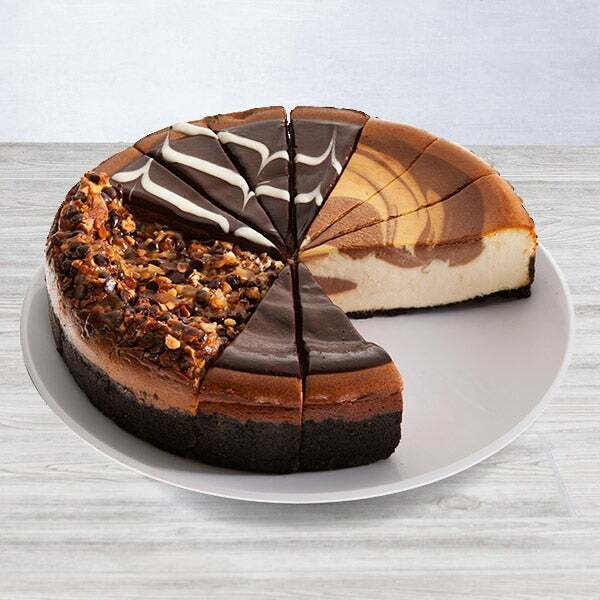 Chocolate Lover's Cheesecake Sampler is rated 4.9 out of 5 by 11. Rated 5 out of 5 by Sheilaa from Loved it My family loved the cheesecakes. Also sent a gourmet gift basket to my hairdresser, but no response yet. Rated 5 out of 5 by Phluphphie from Awesome Cheesecake The cheesecake arrived early morning and was wonderfully packaged in both a pretty box and then inside an ice chest keeping it cold. The cheesecake was fresh, creamy, in short, wonderful. The variety pack also meant something for everyone. Rated 5 out of 5 by FlaDeb from Chocolate is always a great gift! I sent this to my daughter for her birthday. She said it was a wonderful surprise! The chocolate cheesecake was delicious! Rated 5 out of 5 by Audmom3 from Fabulous! I sent this to my daughter at college for her birthday. She flipped over it! Her and her friends devoured it! The said it was amazing! She was so happy! Rated 5 out of 5 by Miss lady from chocolate lover's I sent this to my niece just to cheer her up. she absolutely love it. If you think they like chocolate now, just wait until after they’ve tried this delicious sampler. Made up of Turtle, Triple Chocolate, Chocolate Swirl, and Chocolate Raspberry, this delectable assortment makes chocolate taste better than ever before.